Well, it's that time of year again. We've packed away the art and closed up for the season. It's been a wonderful summer and we've loved seeing so many of you. We hope you've enjoyed reading our blog and hearing about what's going on in Galliott Studios. We're heading off for some long awaited hikes and hoping the sunshine holds out! We're looking forward to spending the winter working on our art and planning fun stuff for next summer! Well, it's that time of year. We're packing up the art and getting ready to shut down for the season. Here's a photo of our walls looking a bit bare. Jenn's dancing, it makes us feel better about packing away all of the art! Here's a fact for you: Liv loves mounties. In particular, tall handsome mounties in their red garb. They're intimidating, but fabulous. She loves them enough that when one walked past the Studio she ran outside and chased him down the road to get a photo. 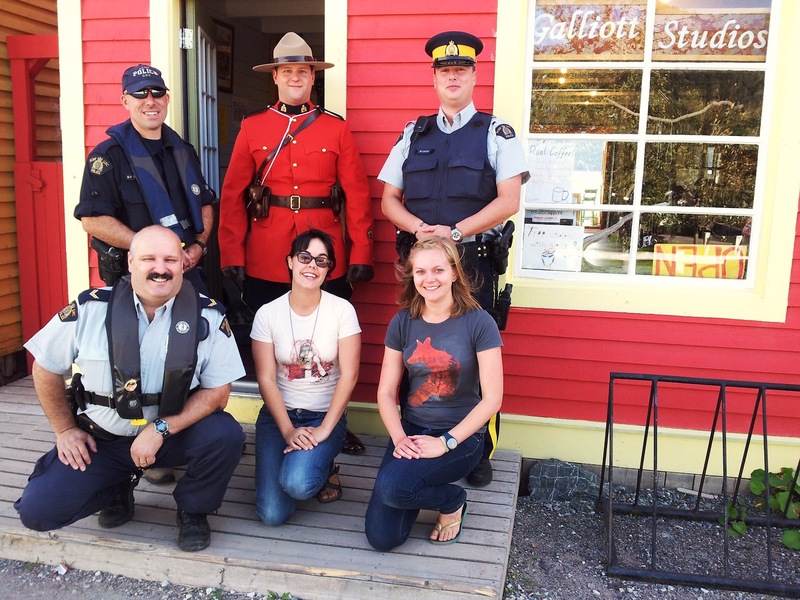 Here it is, the Galliott Studios girls with Mr Mountie and his law enforcement buddies! As promised, a photo of Liv finishing the cruise ship captain's bags. They'll be receiving them today, so fingers crossed they like them! This weekend we'll be visited by not one, but two cruise ships! We like it when the cruise ships come in. It means we have lots of new people to chat to. And we like looking at the boats! A few posts back you may remember that we were making espresso cups for goody bags for the Writers at Woody Point crowd. And we're making treats for the cruise ship captains. Woody Point loves a good goody bag it seems! This time around we've been entrusted with making the bags themselves. Pressure! 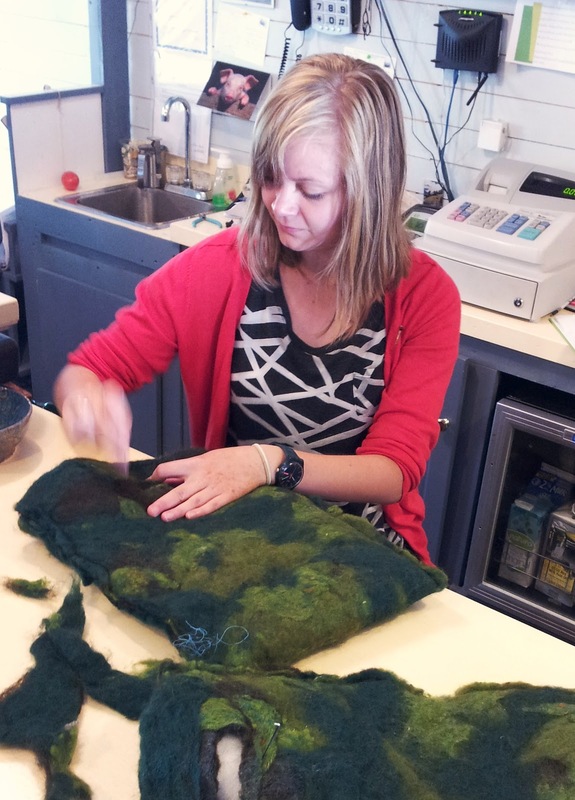 However, we've stepped up to the task and felted lovely bags for the captains of both ships. The welcome committee will fill them with lots of lovely prezzies and hopefully the captains will really enjoy them! We'll try posting a photo once the gremlin leaves the electrics and we can get Jenn's phone working! We just realised that throughout our entire blogging history we haven't actually said anything about our town! We know that there's lots of people who check the blog from lots of different countries and we thought you might like to hear more about it! 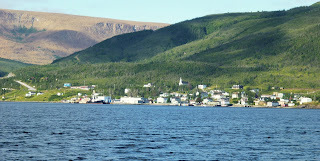 We're located in Woody Point, which is in Gros Morne National Park on the west coast of Newfoundland. 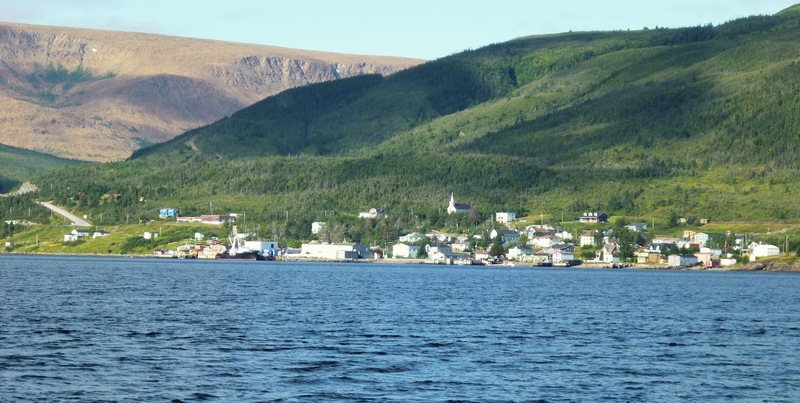 Gros Morne is a UNESCO World Heritage Site, because it's so beautiful and also because of our unique geological features. We like it here a lot. It's a small place with an awesome community. There's lots of people here who's families have lived in town for generations. Jenn is a 5th generation Woody Pointer. 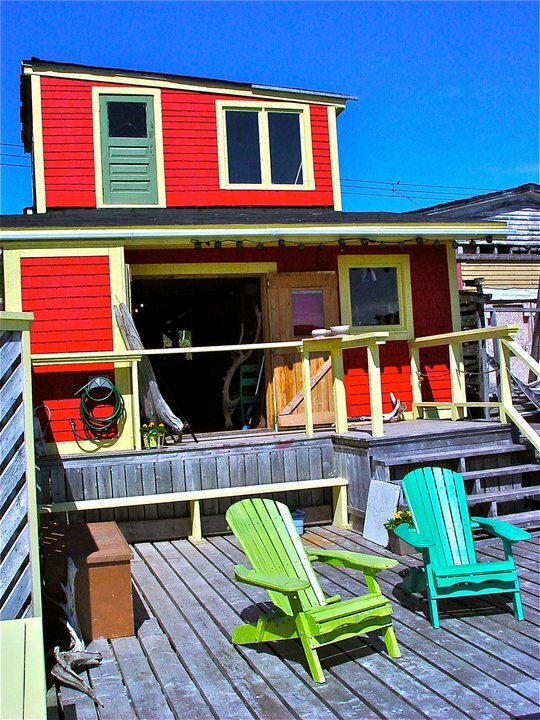 Her Pop on one side owned the Studio back when it was a fishing shed. And her Grandparents on her Mother's side owned the Roberts House, which is open to the public as a heritage property. She's adamant that the sewing machine in there belongs to her, so when you visit don't covet it too closely! There are lots of fun events that go on here in the summer. We've blogged about some of them, but here's more stuff you could check out! 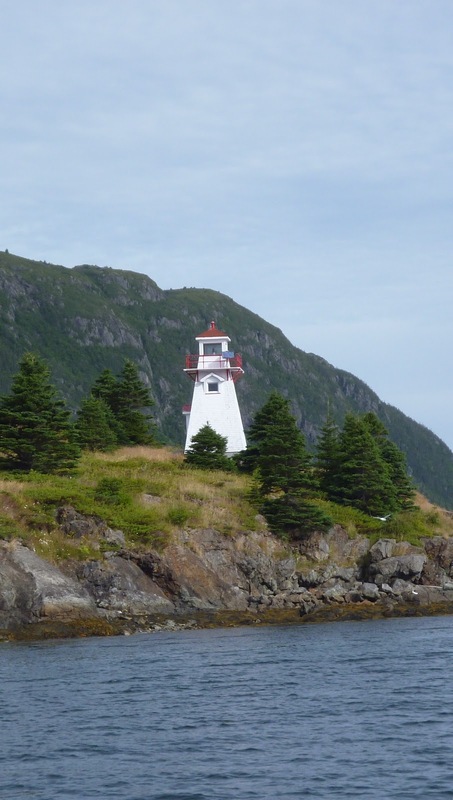 It's not technically in Woody Point, but Trails Tales and Tunes festival takes place in Norris Point, which is just across the bay. Here's their website http://www.trailstalestunes.ca/ It's pretty easy to get to Norris Point. 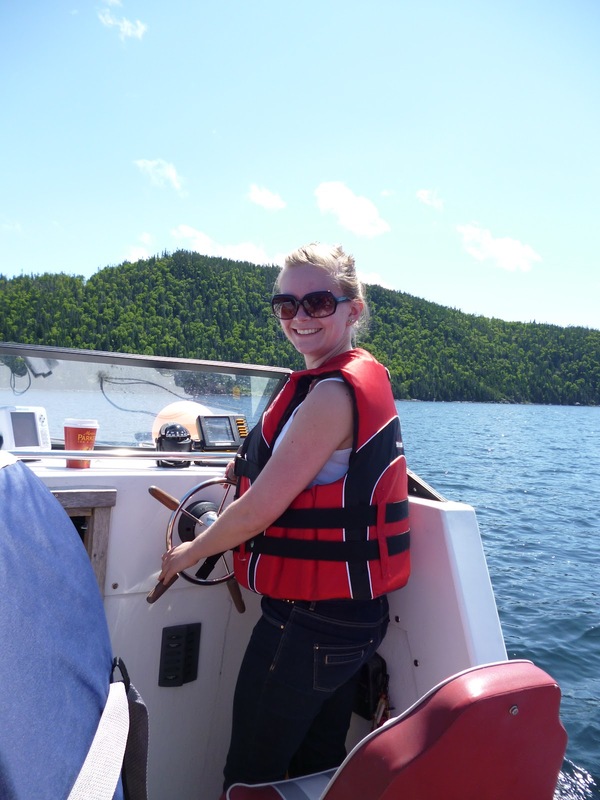 There's a water taxi, or you can take your boat over. Here's Liv driving over! There are lots of other, impromptu events that take place, so whenever you visit there'll be something great to see and do. Woody Point is easily our favourite place in the world. And we're reasonably well travelled ladies. We think you should come visit. Hopefully we'll get to see some of you, we'd like it if you told us you found us on our blog!